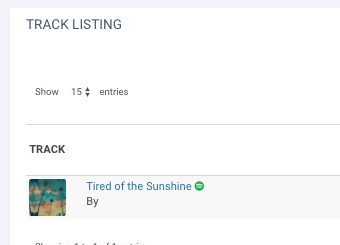 Sometimes you may find yourself looking at your latest album release on Chartmetric and realizing that it is not yet showing on your artist profile. This can easily happen because there is data for that album on Spotify but the link to the artist profile on Chartmetric hasn't occurred yet (see example below). We check for new release data roughly once per hour and a link to the artist page will appear within 4 hours. The short answer, if your release isn't linked to an artist in Chartmetric yet, the most you will have to wait is 4 hours, after which time you will see your album and that it is linked to the artist profile . For new album pages, there is a cache, so changes can take up to 24 hours to appear.